The Mattress Factory produces a robust series of educational outreach programs in local schools around the Pittsburgh region. Our educators work with teachers and students in classrooms to actively investigate the creative practice of resident artists as they experiment with new materials, take risks and communicate ideas through installation art. Over a series of twenty sessions, I worked with an art teacher named Donna Hetrick and eight of her advanced art students at the Obama Academy in East Liberty to create a series of site-specific installations throughout their school. During my first ten visits, we focused on shorter exercises that I created to help familiarize the students with installation art and the role that context plays in creating an installation. The first exercise I gave them was to create a mini-museum that had to house five objects of great importance to them. It also had to be small enough to be stored on their body somewhere. One student painted tiny images of his objects on his keys. Another created a tiny paper house with small clay sculptures of her objects inside. We then took a field trip to the Mattress Factory and the students were impressed and challenged by what they saw. It left an indelible mark on them as they continued talking about it over the course of our time together. Finally, each student had to pick a site in their school for which they were to propose a work of installation art. After they secured their site, Donna and I had them write up a proposal of their installation including all logistics, materials and motivations for their idea. This proposal had to be supplemented with preliminary sketches as well. 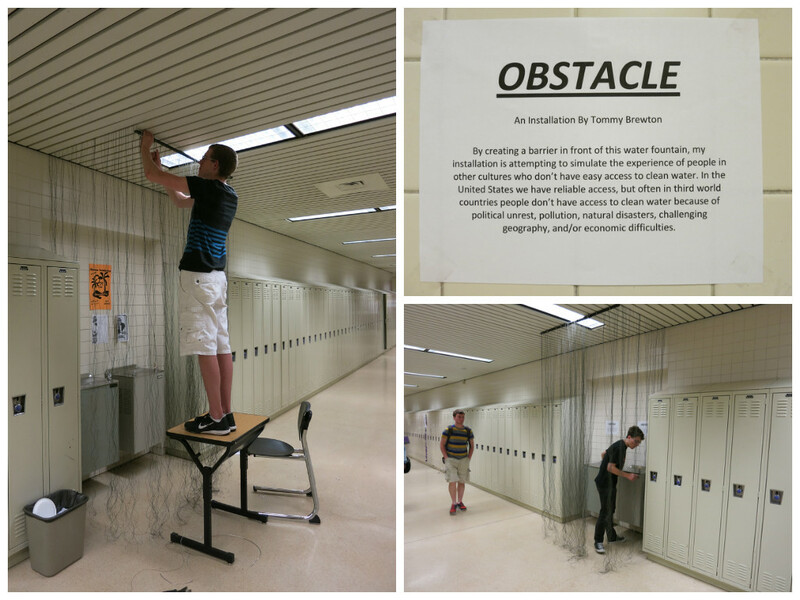 Once their proposals were approved by the principal of the school, the students began creating their installations. 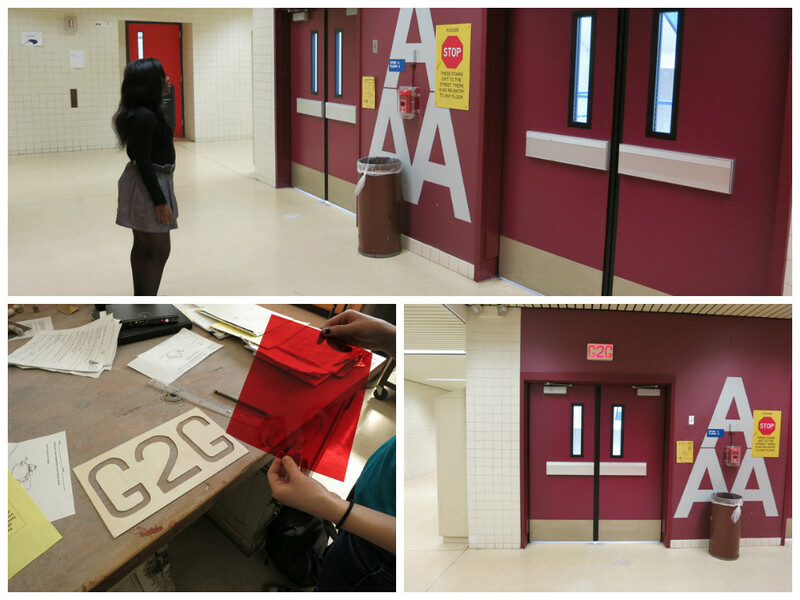 The reactions to their installations were very positive. The student body began talking about them and it was exciting to watch the young artists explaining their ideas and approach to their peers. Below is a list of the installations with a quick description of each project. 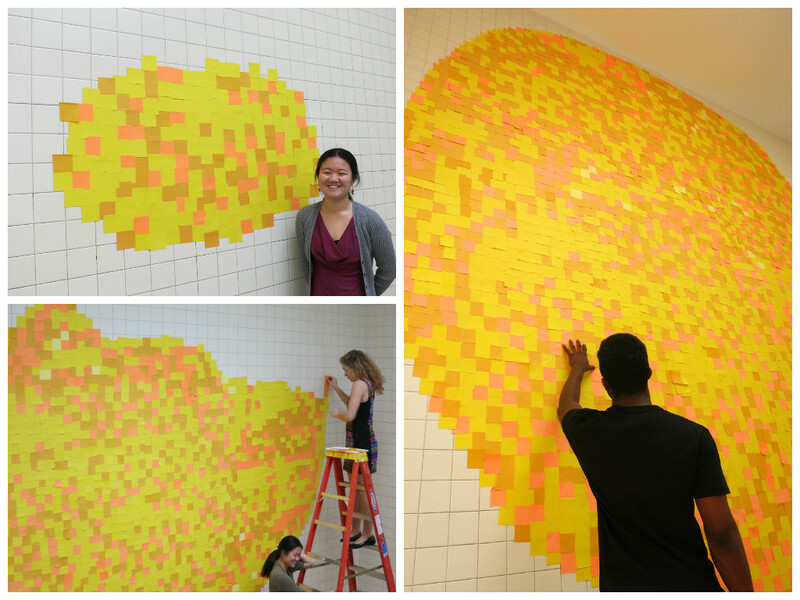 Description: Rina proposed to create a giant image of the sun using small pieces of yellow paper. It took about a month to install this project. Rina was trying to draw awareness to the one space in the entire school where there is an abundance of natural light. Description: Wendy noticed that an exit sign on the 2nd floor of the school was missing its cover, so she decided to create a new cover using the language of text messaging instead of the traditional word “Exit.” This was an effort to address how much of a hurry everyone seems to be in during the school day. Wendy wanted to cause people to look at their environment more closely as well as create an installation that was enhancing or improving upon her school. Description: Myiya wanted to create an installation that was always in a state of constantly growing and changing. 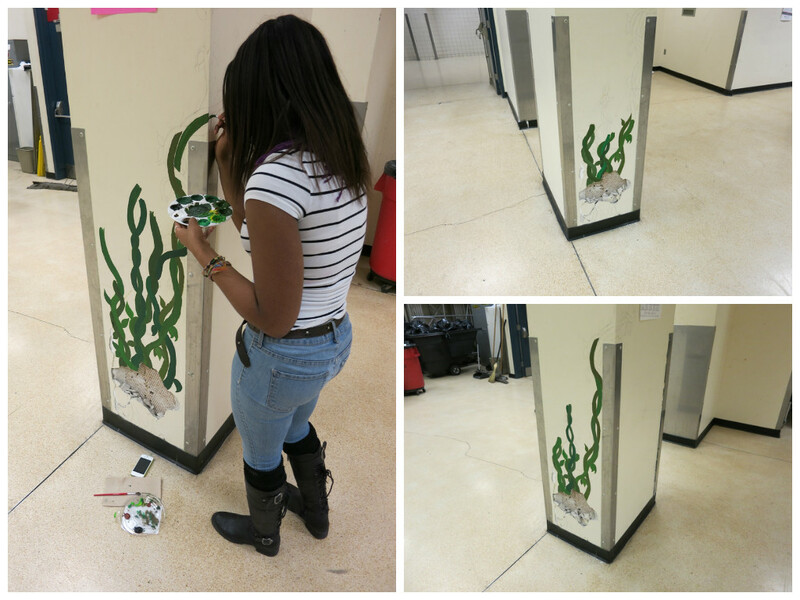 Over two weeks time, she painted an image of a vine growing out of a hole in a pillar near the cafeteria. She expressed her concern about how there has been a hole in the pillar for a long time and it bothers her. So she decided to make something exciting emerging from it. Description: India’s idea stemmed from a quote from Barack Obama in which he states, “Excuses only build bridges to nowhere.” She wanted to visually represent this somehow so she took strips of grey paper and asked her friends and teachers to write an excuse on each piece of paper. Then after she collected well over 60 excuses, she used the paper to construct a bridge on the wall of the school. One side of the bridge is emanating from a students mouth while the other end of the bridge is collapsing. Description: Tommy’s IB Diploma theme is clean water. He decided he wanted to create an installation that would draw awareness to how fortunate we are in the United States that we have easy access to clean water. So he suspended wiry string around a water fountain in the school to cause people to paused before they drink the water. Then there was a printed explanation of the project above the fountains. I led a two-week workshop for kids ages 9-12 called “Mammoth, Monstrous, Massive Sculptures.” During this time we created large scale sculptures made out of low-tech materials like cardboard and paint. We then brought the sculpture to life by using our bodies to control them. During the first week, I had the students create a series of smaller sculptures to help familiarize themselves with the materials and ideas. During the first shorter exercise, I had each student bring in an small object then asked them to replicate that object five or ten times its original size using cardboard, tape and paint. We installed these objects in the Mattress Factory Garden and the kids were excited to see their large objects in a new context. The next project centered around the concept of “Ephemeral.” We discussed the definition of ephemeral then I showed them examples of Ephemeral Art. I broke them into teams of 3-4 and gave them one day to create an ephemeral experiences using cardboard and paper. This exercise went wonderfully and I was excited to see how well they understood and internalized this concept. We had a spirited discussion after each of the teams presented their final project. The last week of the workshop was spent working on two large-scale interactive sculptures. We brainstormed ideas for what we wanted to become as a group and quickly decided to make two projects. One team called “Team Iceburgh” made a giant iceberg out of cardboard, tape and paint. Each part of the structure was made to fit one of the students so they could all be a part of the overall structure. In order to give the illusion that it was melting, they all moved in unison with each other and slowly knelt down to create the illusion the melting ice. The second team was called “Pencil Plan” and they created a large box of colored pencils that they inhabited. Each person was clad in a costume that resembled a colored pencil. The costumes were quite creative as they involved a hat with a tip that could be pressed down to mimic the dulling of a pencil’s lead. The kids acted out a skit where they ran out of the box, dulled themselves by drawing and then had to return to the box to get sharpened. Both projects were a huge success. I was amazed at how well the kids worked together to bring their ideas to life in such a short time. Visit John Peña's website at johnpena.net. Whether physically present in my work or creating a sculptural object, the methods I use attempt to capture the immediate in gestures, from a place that I both know and do not know. I experiment with performance, video, photography and collage, often in the same piece. I like to explore conflict in my work, always leaving several entry points for the viewer. My natural inclination is to do things that are improvisational. To counter this, I’ll sometimes do a piece that’s very controlled and meticulous to refresh and regroup. But occasionally, I combine these two approaches. Most recently, I’ve been focusing on activating the performance in a sculptural object. When I arrived at work this morning, Russ was standing in our administration office, clad in a mechanic's blue collared jumpsuit, stirring a pot of salt water. I would have raised an eyebrow, but things like that are more common here than not; one of the coolest aspects about working at the Mattress Factory is that we get to witness artists in action as they prepare their installations for public view. Russ invited me and my coffee out to the garden to watch him "salt" some of the pieces for his installation, which will incorporate old car parts crusted in salt. Between hurling ladles of salty sludge at a rusted and graffiti-ed fender he pulled from a junkyard in Detroit, Russ explained that his process for this project is to not alter the original metal piece in any way, but to apply layers of salt, letting it "cure" in the sun for a few days at a time. Russ stressed that he likes to leave the way the salt adheres to the metal to chance, and referenced Richard Serra's early work with flinging red-hot lead at the wall and floor in Jasper John's studio. I left Russ as he was dripping the last crystals of salt onto his fender and grill, wondering if the salt would eventually completely obscure that fabulous section of aqua paint on the fender. I suppose we won't know until the piece is finished--that is the exciting thing about installations at the Mattress Factory...you never know. Save the date for the opening reception of new works by Detroit: Artists in Residence, Janine Antoni and Chiharu Shiota, September 12 from 7 - 9 p.m.
516 Sampsonia Way, our soon-to-open 2,500 square-foot exhibition space, was a rental property from the late 1800s until the 1980s. While Molly Tighe, our archivist, was digging through historical documents to research the building, we were contacted by Richard Morris, whose family lived in the property from 1934 until 1963. Morris was a wealth of information, and provided stories and pictures about life in the North Side at the middle of the century. Since his stories give such a great sense of space for the building and resonate so well with the themes of our opening exhibition there—Chiharu Shiota: Trace of Memory—we decided to make a video, and let Morris take you through a virtual tour of the building before it opens on September 12th. Enjoy! For the past two weeks an enthusiastic bunch of students have taken up their own artist residence at the Mattress Factory for Community Art Labs. 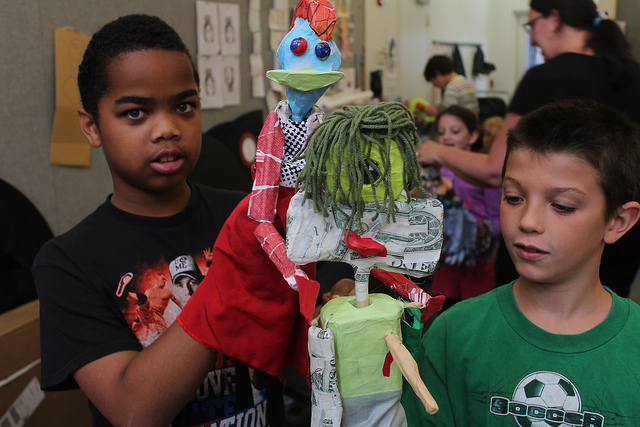 Pittsburgh puppet maker Cheryl Capezzuti has been working with a group of 10 to 13-year olds to transform both every day and unusual materials into one-of-a-kind creatures and full-body puppets. 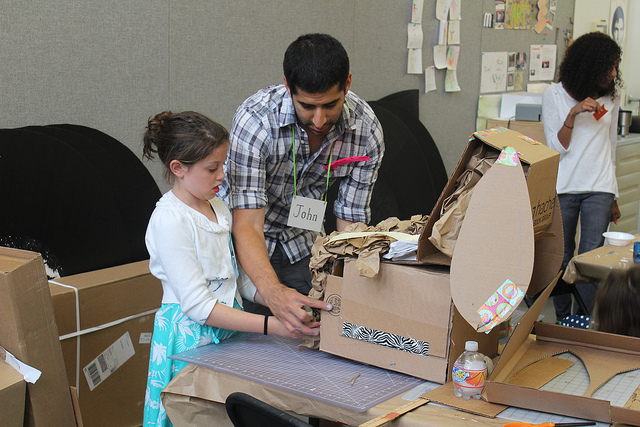 Artist John Peña has been guiding students through various stages of sculpture, from miniature to massive! 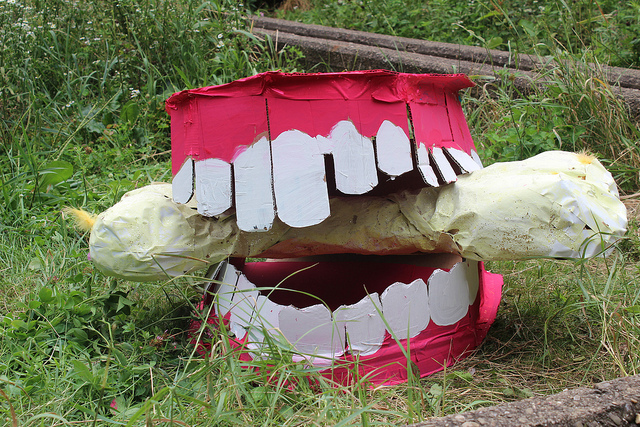 You can see more pictures of Community Art Lab on our Flickr page. Do you know what installation art is? -Yes, art you can walk into – a place that you can actually live in. -Yes, art that you can get into – inside of it and connected with it. -Yes, art that makes use of space or that you can be inside of. -Yes, when art is made in the space and it is IN the space. -Something that is creative and can use any material, anything you can imagine. What have you learned at Community Art Lab? -How to work better with other people, work more quickly and execute an idea faster. -That there is art that stands out and art that doesn’t. I learned that "ephemeral" is something that lasts for a very short time. -Art isn’t just painting and sketches. You don’t need anything fancy to make art (i.e. we are using a lot of cardboard!). What was your favorite activity at Community Art Lab? -Making the project where something fits in your hand five or ten times bigger. 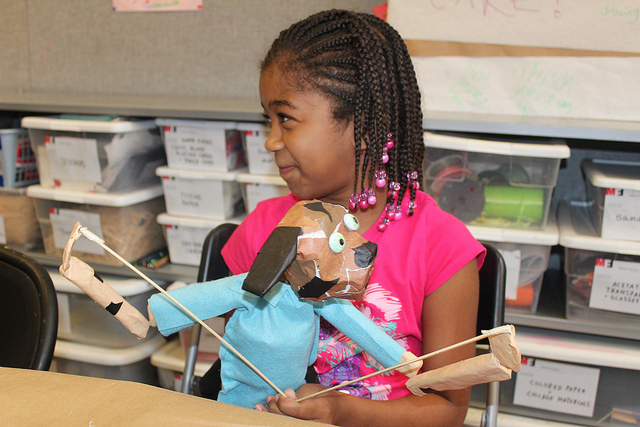 -Making small and big puppets – it was very artistic and we used recycled materials. Working together on one project but trying different materials. -Giant puppets and making giant things. How did you like being at the Mattress Factory all day? -I like it, it's fun and different. I’ve never been to a camp with so many activities and you actually get to go outside and eat lunch in a piece of artwork. -I like it a lot. I like the atmosphere of both classes. It is happy like a family. -I LOVE it, because it is fun and creative and you get to not just look at art, but go in to it. How does Community Art Lab compare to other programs you have participated in? -It is more exciting here and you get to do everything. -It is better than others, you can make so many things with all your teachers and it is so fun. -Everyone is treated the same – both adults + kids. There is a better quality of art/materials. -This program is a lot more work—more collaborative. camps have projects I already know and something I don’t know is more interesting. -All other programs were science / math, so this was more creative and laid back. There were no wrong ideas for projects. What improvements could be made to Community Art Lab? -Longer – having more weeks. -We could add more weeks and have more activities and different artists come. -The Mattress Factory is awesome. -I think that there is a good amount of staff who were all very charismatic and I’m glad they had air conditioning. All of the students involved in this summer's Community Art Labs will take part in a celebration August 9 from 6-8pm. Come check out what all the budding artists who participated in our workshops have been up to this summer. Invite your friends to come with you and see incredible artwork (both in our permanent collection AND made by students) and never-before-seen performances, participate in hands-on workshops and enjoy light fare. Free; RSVPs requested to felice[at]mattress[dot]org. Thanks to all of our 2013 Community Art Lab participants. We're glad we have air conditioning too! During the last week of the installation, Feminist And..., we detailed our intern Matthew Liner to document some of the works for our blog. Matthew dug deep and spent time in each of the spaces to share them in his own words. Below are his interpretations of works by Parastou Forouhar, Loraine Leeson and Carrie Mae Weems.